Staying competitive in today’s innovative design environment requires the highest degree of collaboration between your mechanical and electrical design teams. SOLIDWORKS PCB, powered by Altium, brings this collaborative element to focus with seamless workflow collaboration. 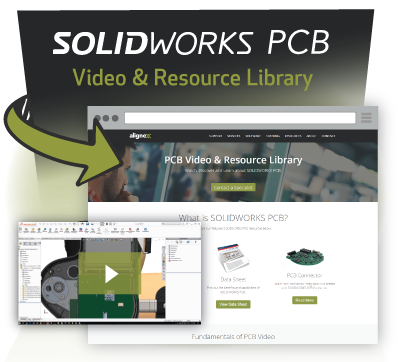 SOLIDWORKS PCB has combined the latest features in PCB design with a streamlined interface and linked it with SOLIDWORKS to give you a collaborative design experience that gets your PCBs done both on-time and on-budget. View a PCB Video & Resource Library or compare features in our PCB Product Matrix. Intelligently linked design data keeps your entire design team focused and aligned. A managed ECO change process makes updating your design easy, all while keeping your efficient workflows intact. SOLIDWORKS PCB doesn’t interrupt your existing design workflow. SOLIDWORKS PCB is seamlessly links with SOLIDWORKS, so you can keep using the tools you know for mechanical design and work on the electrical side of your design in a powerful PCB design tool. With your existing workflows remaining separate but in sync, your design efficiency remains at its best. Backed by more than 25 years of R&D experience from Altium, the PCB design engine in SOLIDWORKS PCB provides all the features you need to keep up with today’s design demands. Powerful routing tools and clearance checking options keep your designs in-sync with manufacturing constraints while keeping your design process efficient. The streamlined schematic editor in SOLIDWORKS PCB gives you all the tools you need to get your schematic out of your head and into reality as quickly as possible. Take advantage of real-time component supply chain information and a powerful rule checking system to keep your design intent in-line with specific layout constraints. In SOLIDWORKS PCB, an integrated the schematic editor and PCB layout engine provides one integrated design environment that shares a common interface. Plus, with a streamlined and modern interface, finding those features you use most often is easier than ever. With today’s complex designs, it becomes more important than ever to have the high-performance tools at your disposal to keep you going. SOLIDWORKS PCB has got all the tools you need to tackle those complicated design processes that are always made easier with intelligent tools. Compare features of SOLIDWORKS PCB, PCB Connector and CircuitWorks solutions.